A judge made the order after an agreement on Charlie’s end-of-life care plan couldn’t be found. A UK HIGH Court judge has ordered that critically ill British baby Charlie Gard should be moved from a hospital to a hospice, where he will “inevitably” die within a short time. Judge Nicholas Francis made the order after Charlie’s parents and Great Ormond Street Hospital in London, where he is being treated, failed to meet a deadline to agree on an end-of-life care plan that could have seen the baby kept alive for several more days. The judge said the actions “will inevitably result in Charlie’s death within a short period of time thereafter”. His parents, Connie Yates and Chris Gard, spent months trying to persuade GOSH to let Charlie go to the US for an experimental treatment they believed could help him. Charlie’s doctors opposed the idea, saying it would not help and could cause him more suffering. Earlier this week Charlie’s parents gave up their legal fight, acknowledging that the window of opportunity to help him had closed. They then sought to take their son home to die, but GOSH said it was not practical. At an emotional hearing yesterday, the judge said Charlie would, inevitably, end his days in a hospice. Yates left the hearing in tears. The case has become the catalyst for debates medical intervention, the role of the state and the rights of the child. Email “Charlie Gard to be moved to hospice for his final days after ruling by judge”. 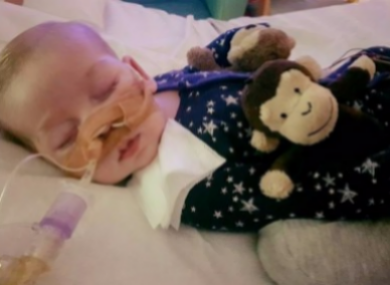 Feedback on “Charlie Gard to be moved to hospice for his final days after ruling by judge”.